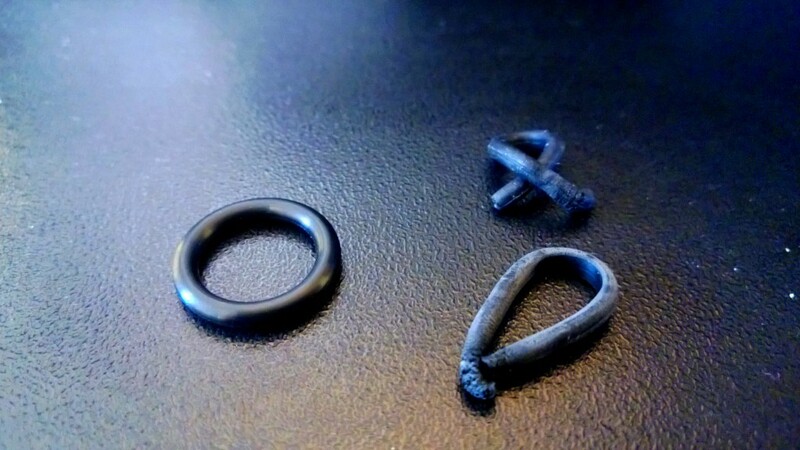 The rubber o-rings on the right are from my old G.I. Joe figures. Both are probably around 25 years old. They’ve become dried out, cracked and broken in that time. The one on the left is a brand-spanking new one. Figured I’d take a moment to talk about the rubber o-rings I’m using to fix my G.I. Joes. Contrary to what you may think, those aren’t regular old rubber bands that keep the Joe action figures together. They are actually plumbers o-rings, generally used to prevent leaky joints in faucets. The strong rubber circles can take a lot of stress, which is undoubtedly why Hasbro chose to use them. In my searches online, I came across different websites suggest different specifications for the small bands. Generally they are about 3/4-inch in diameter or 3/8-inch. You can buy them in bulk or in sets of 10. I kept it simple for my first time out and got a package of 10 at Home Depot. I went with #10 O-Ring from Danco, which has an 11/16-inch outer diameter (O.D. ); 1/2-inch inner diameter; and a thickness of 3/32-inches. It seems slightly bigger than the one found in the Joes themselves, but does the trick perfectly fine. You can get them at your local Home Depot, or purchase them online here.